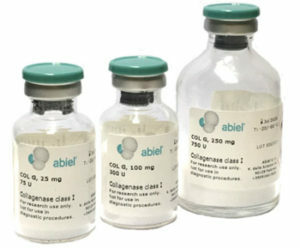 Suitable for all tissues, Recombinant Collagenases Class I (COL G) and Recombinant Collagenases Class II (COL H) preserve your stem cells and primary cells. • COL G and COL H can be mixed in specific formulations for each application. • Each formulation is perfectly reproducible and does not require any preliminary test. • The absence of other proteolytic activities and the innovative purification technology make the final product remarkably stable and ensure lot-to-lot consistency. 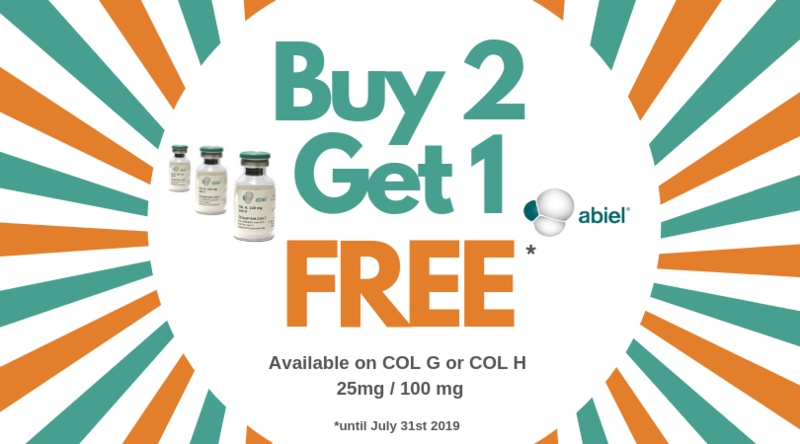 Abiel COL G and COL H are available in vials in 3 different formats: 25, 100 and 250 mg as lyophilized powder for research use only. COL G is a lyophilized, 99% pure, animal-free, endotoxin-free recombinant collagenase class I, synthesized in E.Coli strain and subsequently purified by chromatography. COL G is a research premium grade product. 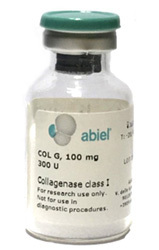 COL G is well suited for tissue dissociation procedures and used in combination with Abiel’s COL H (collagenases class II) can enhance your cell extraction yield and viability in vitro and ex vivo. Order 2 COL G vials and you will receive 1 extra vial for free. The offer is available on 25 mg or 100 mg vials, until July 31st. Our team will support you in the development of the optimal protocol for your specific application. COL H is a lyophilized, 99% pure, animal-free, endotoxin-free recombinant collagenase class II, synthesized in E.Coli strain and subsequently purified by chromatography. COL H is a research premium grade product. 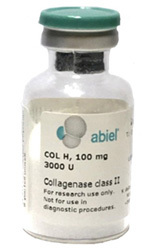 COL H is well suited for tissue dissociation procedures and used in combination with Abiel’s COL G (collagenases class I) can enhance your cell extraction yield and viability in vitro and ex vivo. Order 2 COL H vials and you will receive 1 extra vial for free. Abiel‘s kit packages are ready-to-use and contain COL G and/or COL H and Thermolysin, to perform 3 assays of the study, allowing fully reproducible and standardized blends with highly predictable enzymatic efficiency.